Water is not only necessary for life; it is also both an agent for wellness and beauty. Only one quarter of a litre of water will change skin vitality. A few minutes after drinking water, not only is your thirst quenched, the body’s cells are supplied with more oxygen, which leads to a considerably fresher appearance. Water purifies from within, as it is the best biological means of transport in the body for removing toxins. It supports blood circulation in all organs, boosts metabolism and strengthens the body’s own defence system. helps form structures of large molecules such as protein and glycogen. of waste products and thermoregulation¹. About 2.5 litres of water are needed each day to replace water lost from the body. Sports Medicine Australia recommends children consume 150 to 200 milliitres a day. To be properly hydrated in a temperate climate, adults require some 2500-3000 millilitres of fluid a day, depending on body size otherwise they risk dehydration². Water is an essential nutrient because it is required in amounts that exceed the body's ability to produce it. Human requirements for water are related to metabolic needs.When considering conditions such as athletic activities, increased body activity, hot climates, coffee consumption and many more, the need for water may be substantially higher. Even without perspiration, the normal daily turnover is approximately 4 per cent of total body weight in adults. In a 70kilogram adult this is equivalent to 2.5-3.0 litres a day. Many health authorities recommend that adults consume some six to eight glasses of water a day. The National Nutrition Survey shows 30-40 per cent of the population don't reach this target². Water contains no calories, but uses them after we drink it. That watery cool is not only good for our bodys wellbeing, but also for our mental wellness. Do you drink enough water on a daily basis? 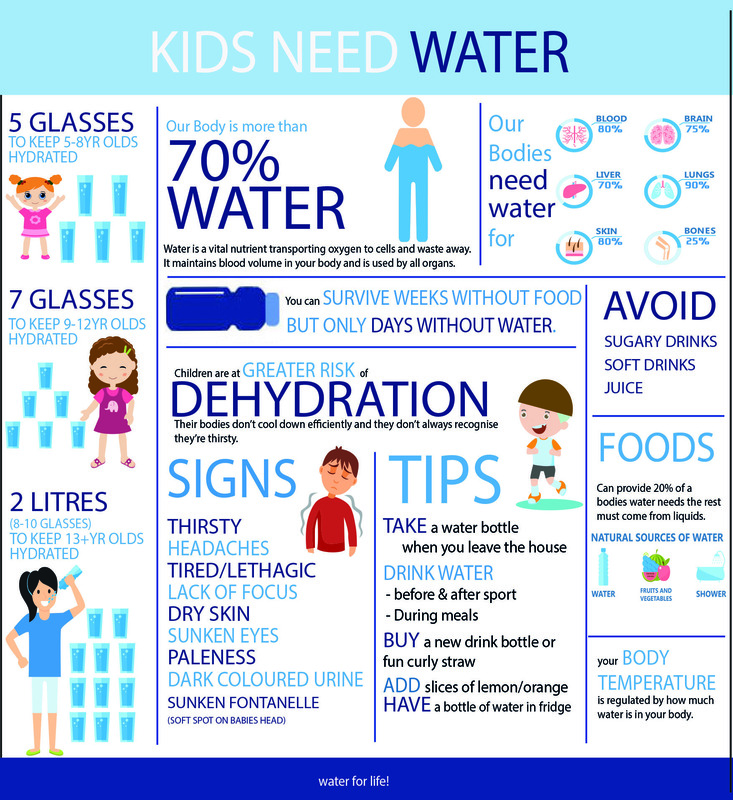 How much water do children need and why? ¹ Dietary guidelines for children & adolescents in Australia "Choose water as a drink - alcohol is not recommended for children" by Kirsti McVay and Sue Jeffreson. ² Dietary Guidelines for Australian Adults "Drink Plenty of Water" by Katrine Baghurst.